Welcome to the last Mystery Chocolate Box of 2016! Anyway, we actually wanted to include this bar in an earlier Mystery Chocolate Box, but the month we tried they were out of stock. So, we had to put it on the shelf until another good time came around, and it finally did this month. Now, the big question is…did they pull it off? Did the enticing list of inclusions deliver a delicious chocolate bar? Well, you’ve tasted it, so it’s all up to you! Can you see how that list of ingredients would make you instantly want to try the bar? Chocolate with cranberries, cherries, and vanilla. Wow! Oh, and for the record, we thought they did pull it off — it was a delicious chocolate bar! This was a bar that came from a land far, far away. (And we know that because we only ship to the United States, for the most part!) You probably won’t guess where (unless you already knew this chocolate maker). And it’s also a fairly exotic inclusion. Not because the inclusion is all that exotic (it’s actually quite common, and something you probably have in your pantry), but it’s one that usually isn’t used in chocolate bars. If it is used, it’s almost always as an alternative sweetener rather than an actual flavor inclusion. One… Yes, it’s just honey! 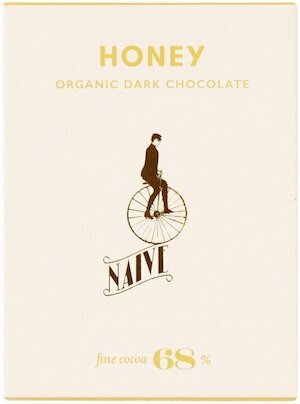 While we have seen one or two bars out there that have honeycomb as an inclusion, this is the only one that simply has honey as the flavor (and it’s not there simply as a sweetener). So we thought that was pretty cool! Two… If you haven’t yet, now you can say you’ve had a chocolate bar made in Lithuania! (the aforementioned far away land). The reason I say “if you haven’t yet” is because this actually isn’t the first Lithuanian chocolate bar that we’ve included! In the November 2015 box, we included the Dark Chocolate with Spices and in the September 2016 box we included Dark Milk Chocolate with Tahini & Roasted Sesame — both by Mulate Chocolate, also a Lithuanian chocolate maker. Can we be a bit honest here? While we were looking forward very much to tasting this bar simply based on the reputation of the chocolate maker, we were a little unsure about how it would really be. We thought there was a chance that the inclusions might not make a great chocolate bar (it sounds like it would make a great parfait though!). However, those small worries were definitely put to rest after trying it. One bite in, and we knew it. They had managed to create another winner. And we knew we had to share it with you. Let’s see what it was! Whenever you get a chance to try a NEWTREE bar, take it. Words of wisdom. But anyway, back to this bar. We loved the crunch provided by the granola — a slightly different crunch from nuts, which is a much more common crunchy chocolate inclusion. And the lime managed to accentuate both the chocolate AND the granola flavor. Job very well done. And that’s all for the last Mystery Chocolate Box of 2016! Hope you loved it and, more importantly, are ready to continue enjoying the Mystery Chocolate Box experience in 2017. No Replies to "December 2016"